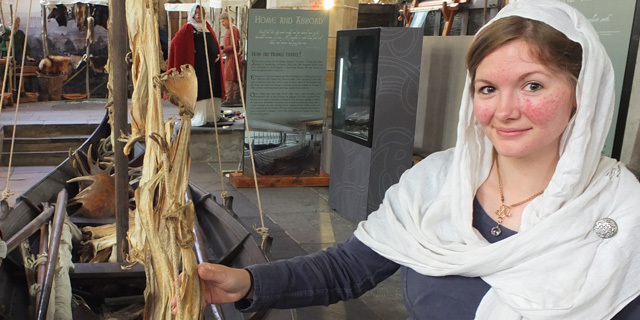 Working in partnership with York Museums Trust, The JORVIK Group invites you to discover the hustle and bustle of Viking York in this special exhibition devoted to the lifeblood of the city of Jorvik; international trade. Explore the impact that global commerce had on the city, with settlers from all over the Viking world and beyond calling York their home, creating a melting pot of cultures and ethnicities. Experience what it would have been like to live in the city in a specially constructed Viking street scene. Interact with the Norse residents face to face, as the Vikings of JORVIK Viking Centre will be on hand to guide you. For Access information at York St Mary’s please click here. With JORVIK Viking Centre being re-imagined following the flooding in December 2015 a series of special exhibitions have been created to continue to showcase the lasting impact of the Vikings in York at three iconic venues in the city. Using artefacts from the JORVIK collection, each exhibition will explore a specific aspect of Viking life and culture and give visitors to York the chance to get up-close and personal with the Norse inhabitants of the city from 1,000 years ago. These special exhibitions are for a limited-time only before the reopening of JORVIK Viking Centre in spring 2017.